Persistence Market Research (PMR) offers a four year trend analysis for 2012 to 2016 and an eight year forecast for the healthcare cloud computing market between 2017 and 2025. This study demonstrates the market dynamics and trends globally across key regions in the globe which have an influence over the current nature and future status of the healthcare cloud computing market during the forecast period. The research report titled “Healthcare Cloud Computing Market: Global Industry Analysis (2012-2016) and Forecast (2017-2025)” published by PMR, supports the reader in gaining relevant acumen to slate key decisions and devise strategies. The market report involves weighted analysis which can be used to gain competitive advantage in the coming years. This research report provides detailed analysis of healthcare cloud computing market and offers insights on the various factors driving popularity of these systems. The market study provides comprehensive assessment of stakeholder strategies and imperatives for succeeding in the business. The report segregates the market on the basis of application, deployment model, component, service model, and region. The report starts with an overview of the global healthcare cloud computing market. This section includes analysis of factors, opportunity analysis and technology trends which are influencing the healthcare cloud computing market. Impact analysis of key growth drivers and restraints, based on the weighted average model and PMR analysis and recommendation is included in this report to facilitate clients with crystal clear decision-making insights. The global healthcare cloud computing market is categorized on the basis of application, deployment model, components, service model and region. On the basis of deployment model, the market is segmented as public cloud, private cloud, and hybrid cloud. The service model segment is segmented as SaaS, Paas, and IaaS. The component segment is segmented into software, hardware, and services. A detailed analysis has been provided for every segment in terms of market size analysis for healthcare cloud computing across different regions. The section provides a detailed analysis covering key drivers, restraints and trends and key regulations in the region. This section also highlights market presence (intensity map) for key representative market participants. This study discusses key trends within countries contributing to growth of the market, as well as analyses the degree at which drivers are influencing this market in each region. In the final section of the report, we include a competitive landscape to provide clients with a detailed comparative assessment based on categories of providers in the value chain, presence in the healthcare cloud computing portfolio and key differentiators. This section is primarily designed to provide clients with a detailed comparative assessment of key providers specific to a market segment. To calculate global healthcare cloud computing market size, we have considered country wise adoption rate of healthcare cloud computing across different verticals. Further, we have also analysed the revenue contribution from healthcare cloud computing players. The forecast presented here assesses the total revenue by value across the market. In order to offer an accurate forecast, we started by sizing the current market, which forms the basis of how the healthcare cloud computing market will develop in the future. Given the characteristics of the market, we triangulated the outcome of different types of analyses, based on adoption trends. In addition, it is imperative to note that in an ever-fluctuating global economy, we not only conduct forecasts in terms of CAGR, but also analyse on the basis of key parameters such as year-on-year (Y-o-Y) growth to understand the predictability of the market and to identify the right opportunities across the market. Cloud refers to a prototype in which data is permanently stored on servers and accessed by clients with the help of different information systems such as computers, sensors, laptops, and others. Cloud computing refers to a process which involves delivering hosted services to clients. The global healthcare cloud computing market is valued at US$ 7791.4 Mn in 2017, and is expected to register a CAGR of 18.9% from 2017 to 2025. Increasing demand for better healthcare facilities and rising investments by healthcare IT players are major factors driving growth of the global healthcare cloud computing market. According to the report, revenue generated by the global healthcare cloud computing market was valued at US$ 4,216.5 Mn in 2014 and US$ 5,068.3 Mn in 2015. The CAGR of the global healthcare cloud computing market during the period 2014 -2020 was 20.1%. Global healthcare cloud computing market is categorized on the basis of application, deployment model, by components, by service model and region. On the basis of application, the market is segmented as CIS and NCIS. The CIS segment is anticipated to register a CAGR of 20.3% during the forecast period. The component segment is segmented into software, hardware, and services. On the basis of deployment model, the market is segmented as public cloud, private cloud, and hybrid cloud. The private cloud segment by deployment model is expected to dominate the global market in terms of higher revenue and share in the years to come. The private cloud segment is anticipated to grow at a healthy CAGR of 20.3% throughout the period of forecast 2017-2025 and is estimated to reach a valuation of more than US$ 13 Bn by the end of 2025 from a value of US$ 3016.7 Mn in 2017. The hybrid cloud segment is projected to grow at a CAGR of 18.3% during the period of assessment. The hybrid cloud segment is the second largest segment and is estimated at a value of about US$ 2.6 Bn in 2017 and is anticipated to reach a market value of more than US$ 10 Bn by the end of the year of assessment. The public cloud segment is the smallest, compared to these two segments. It is projected to grow at a 17.5% CAGR during the period of assessment to reach a significant valuation by the end of the forecasted year. According to regional analysis, North America accounted for the largest market share in 2016. The healthcare cloud computing market in North America is expected to grow at a 19.6% during the assessment period to reach a higher market valuation of more than US$ 14 Bn by the end of the period of assessment. Moreover, the demand for healthcare cloud computing is increasing in the regional markets of Europe and Asia Pacific, with Europe being the second largest regional market for healthcare cloud computing. 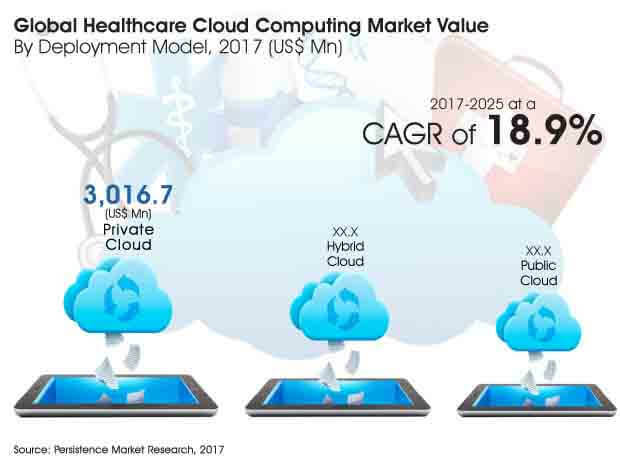 Healthcare cloud computing market in Asia Pacific region is anticipated to reach a value of about US$ 4.8 Bn by the end of 2025 and is projected to grow at a significant CAGR of 18.5% throughout the period of forecast.